Here’s a letter from Rick Williams, the reserve manager of the Northern Jaguar Reserve in northern Sonora, Mexico. The reserve is managed by Northern Jaguar Project (NJP), formed by conservationists from the southwestern U.S. and Mexico. The NJP is dedicated to ensure protection of the jaguar in its northernmost range, as well as a host of other threatened species and habitat. Please visit their website at northernjaguarproject.org to learn more about this beautiful creature and their efforts to protect it. Rick took the picture on the left when he was using the SansBug III to supervise a construction project. He used a small section of a used billboard tarp for a ground cloth for added thorn protection. The NJR consists of over 50 thousand acres of former ranches in rough foothill mountains, and with the infrastructure very primitive, I camp every night I’m there, often moving daily to a new location. The ease of setting up and taking down a SansBug is a great help so I can concentrate more on my work than on making and breaking camp every day. And, of course, this convenience assures me that I have a good bug, scorpion and snake proof tent to sleep in every night. 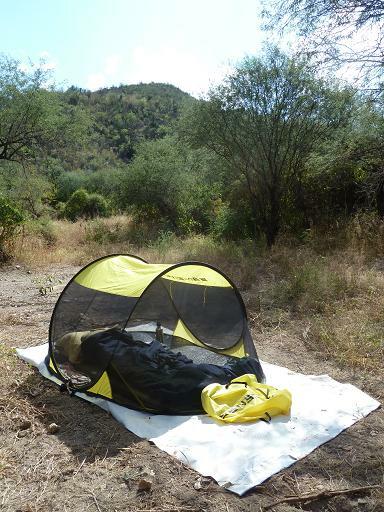 Without the SansBug, I’m sure that some nights I would cut corners from being tired, not properly fix a mosquito net or pitch a conventional pole-stake-rope-rainfly tent, and get bitten by something, or at least awakened in the middle of the night by the inevitable buzzing in my ear of mosquitos. As well, I greatly enjoy the almost all net design, because the reserve is hot during much of the year. Thank you so much for your product, and I might say as well for selling it at a reasonable price.